Ningaloo is home to marine turtles and sharks, which are some of the most iconic and ancient forms of marine life in the world, yet we still know relatively little about the ecology of these wide-ranging species. Dr. Mat Vanderklift releasing a satellite tagged green turtle with the help of Cape Conservation Group volunteers (Image Credit: Richard Pillans CSIRO). Ningaloo provides important habitat and relatively undisturbed nesting areas for a number of marine turtle species. The area is also noted for its importance to whale sharks (Rhincodon typus), hosting one of the world’s largest known aggregations annually (between March and June each year). Aggregations of reef sharks have also been observed, suggesting areas within the Ningaloo reef provide important nursery areas for juvenile sharks. The teams research has shown that the area has some of the highest abundances of reef sharks recorded in the world. The objective for the tagging turtles and sharks research theme is to provide fundamental science needed to understand the ecology of these large, wide ranging species, and to involve local community members to increase their understanding of, and capacity to, assist in research. A combination of different types of technology is being used to track the movements of animals tagged during the project. The team’s initial focus for turtle tagging is on green turtles (Chelonia mydas). Green turtles are the most abundant species nesting along the beaches of the Northwest Cape, and Ningaloo is believed to provide vital foraging grounds to this species. Data collected to date on marine turtles also indicates green turtles to be the most abundant species on the shallow reefs habitats being studied by the shallow reefs research team. Shark tagging includes whale sharks, which visit Ningaloo each year, and various species of reef sharks which are resident all year round. Whale sharks are being tagged as part of the project by Dr. Richard Pillans (Image Credit: Anna Cresswell CSIRO). 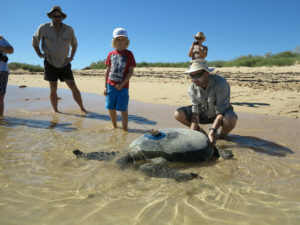 The tagging of green turtles has been occurring at Northern Ningaloo with the support of volunteers from the Cape Conservation Group. A total of 57 tags (acoustic and satellite) have been deployed on turtles since the project commenced in 2015. 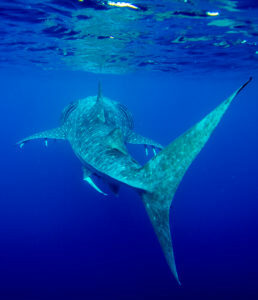 Thirty-eight whale sharks have also been tagged as part of the project, and 41 acoustic tags deployed on a number of shark species known to inhabit the reef. During 2017 and 2018 we sought help from the community to name a number of our turtles and whale sharks! The movements of the satellite tagged animals are now being tracked so scientists can better understand where these amazing creatures travel to and what type of marine habitats they spend their time in. In addition to the tagging, researchers are studying the role of these species in the food webs of Ningaloo, and aim to provide insights into the diet and habitat use of turtles and reef sharks. DNA samples are being collected from whale sharks that visit the Ningaloo Reef to help determine their age which will help to estimate their population size. The research team at CSIRO is being led by Senior Research Scientist Dr. Mat Vanderklift and Dr Richard Pillans. 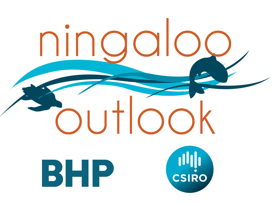 A key element of the Ningaloo Outlook partnership is to provide training opportunities for future scientists. Jessica Stubbs, our PhD Scholar for the Tagging turtles and sharks research theme, will be investigating novel methods to estimate the abundance and ecology of turtles in the Ningaloo Coastal World Heritage Area.